As mentioned in Part I of my Lakmé Fashion Week Winter/Festive 2015 Trend Report, this season, the trends were very strong, making the selection process a tad bit difficult. However, after a careful evaluation, I finally narrowed it down to these. 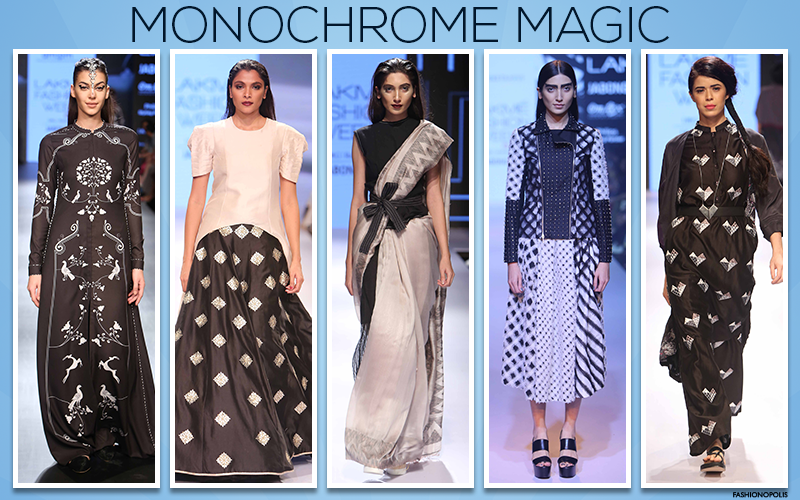 Here is Part II of Lakmé Fashion Week Winter/Festive 2015 Trend Report. While every season of Lakmé Fashion Week celebrates the rich heritage of Indian textiles, this season saw a new wave of Indian textiles and rural handwork. From celebrating the traditional weaves of Banaras to ahir embroidery from Gujarat, ikat from Karnataka and Hyderabad and hand-block prints in Anita Dongre’s Grassroot collection, Lakmé Fashion Week Winter/Festive 2015 was an ode to Indian textiles and crafts. From AM:PM’s block print separates to Payal Singhal’s black and silver embellished Indo-Western pieces, this classic duo was found in a variety of silhouettes and styles. No festive winter fashion week is complete without its share of sarees. 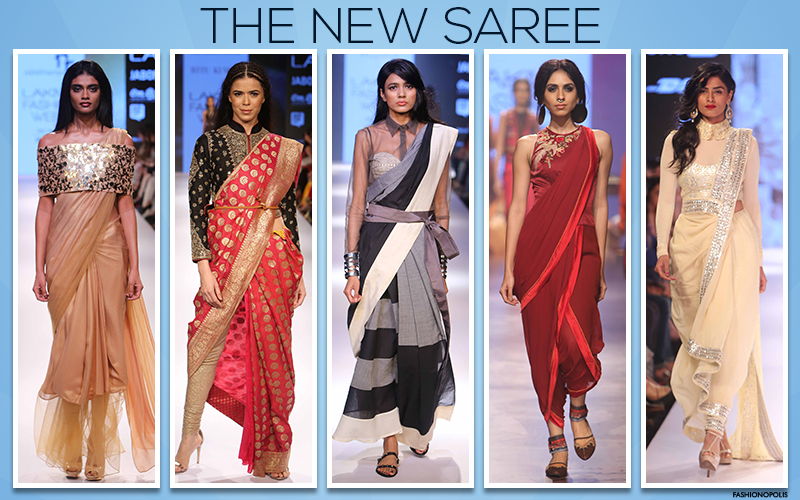 While some designer stuck to the classic drapes, others tried to change the game around and create an all-new saree. Foregoing the classic petticoat, Ritu Kumar chose to drape her saree on a pair of chuddiar while Nikhil Thampi decided to play around with the hemline and add an element of sheer to it and Tarun Tahiliani took it further by getting inspired by the dhoti and creating a jumpsuit saree. 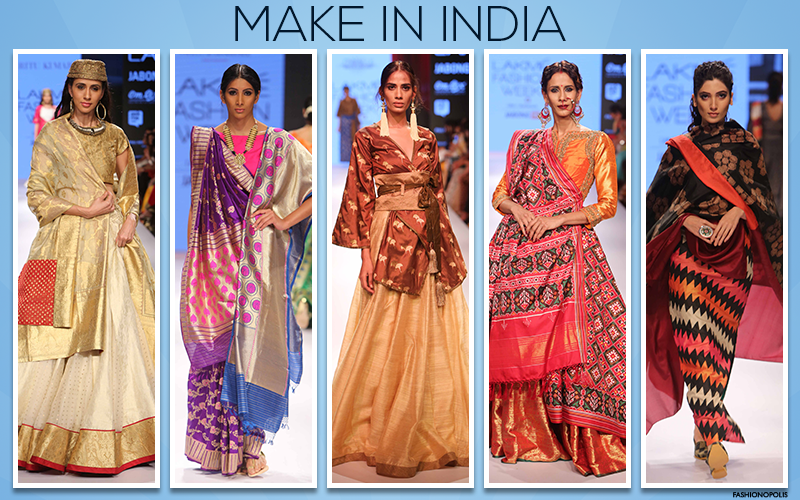 This season of Lakmé Fashion Week saw a new avatar of saree that has left us wanting for more. 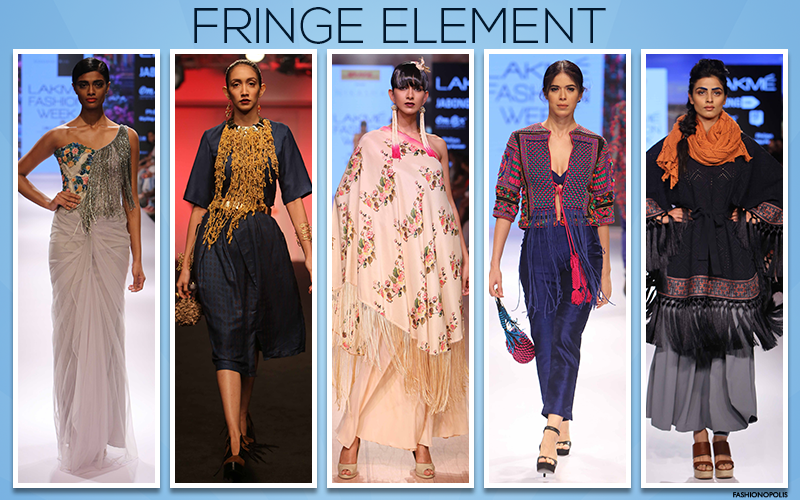 This season, designers seem to be in a fringe state of mind! From Nikasha’s flapper-style fringe to Shivangi Sahni’s boho-luxe tassels to Chiria’s beaded tribal inspired piece, fringe seems to be the preferred trimming of the season. Adorning everything from jackets to capes to evening gowns, the fringe trend is worth giving a go. Layering up for the cooler climate is a norm. However, designers were not layering up to stay warm. They were doing it to stay on trend. 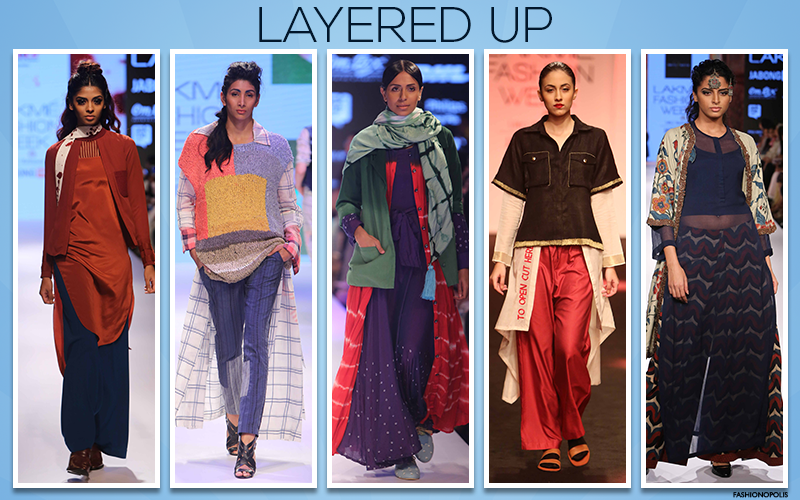 From silhouette mix to texture play and from fusion styling to traditional India attire, layering was one of the most the popular trends for Lakmé Fashion Week Winter/Festive 2015. I like the designs from the monochrome range.